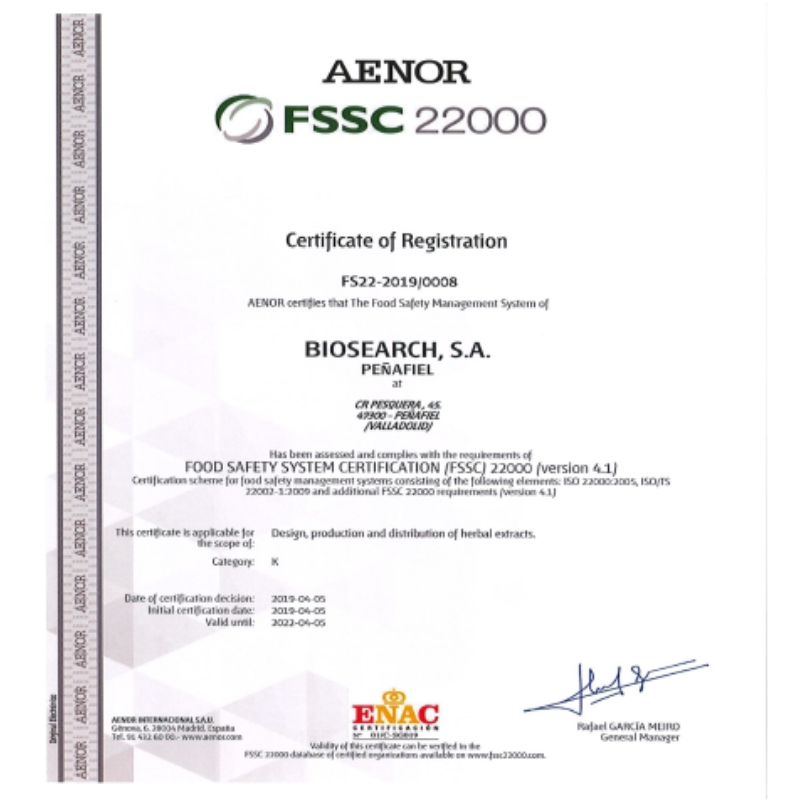 Since April 2019, our Peñafiel manufacturing plant is certified in the FSSC 22000 standard (“food safety system certification”) by AENOR, an accredited entity for the issuance of independent certification to third parties. This standard supports the Biosearch life Food Safety Management system in the Peñafiel factory, for the design, production and distribution of herbal extracts. In Peñafiel (Valladolid), Biosearch life has a factory based exclusively on extraction processes with water, without the use of other solvents and with different active purification units (ultrafiltration, centrifugation, osmosis and chromatography) that make it possible to obtain water-based botanical extracts with a high degree of purity. This certification is a new recognition of the reliability of Biosearch Life’s products, maintaining the high level of trust from its customers and improving its competitive market value. This site contains business-to-business information, intended only to companies. This website is not intended for the final consumer. Not intended for sale or advertise a product or make labeling statements . The statements contained herein have not been evaluated as health claims by the authorities. The statements have not been evaluated by Health Agencies. The products contained herein are not intended to diagnose , cure or prevent any disease. It is the sole responsibility of the company selling the final product to ensure that all national requirements are followed.